For Turkey’s ruling Justice and Development Party, the loss of the capital Ankara in local elections was a shocking blow. But on the other side of the country, the party delivered its own surprise victories, winning several major Kurdish-majority provinces. The party of the president, Recep Tayyip Erodgan, was hardly expected to win across the Kurdish-dominated southeast of the country, where the pro-Kurdish People’s Democratic Party (HDP) dominates, and where Erodgan’s hard line against the insurgent Kurdistan Workers’ Party (PKK) and Syrian Kurds across the border might be expected to count against him. Yet his party, commonly known by its AKP acronym, made a strong showing. 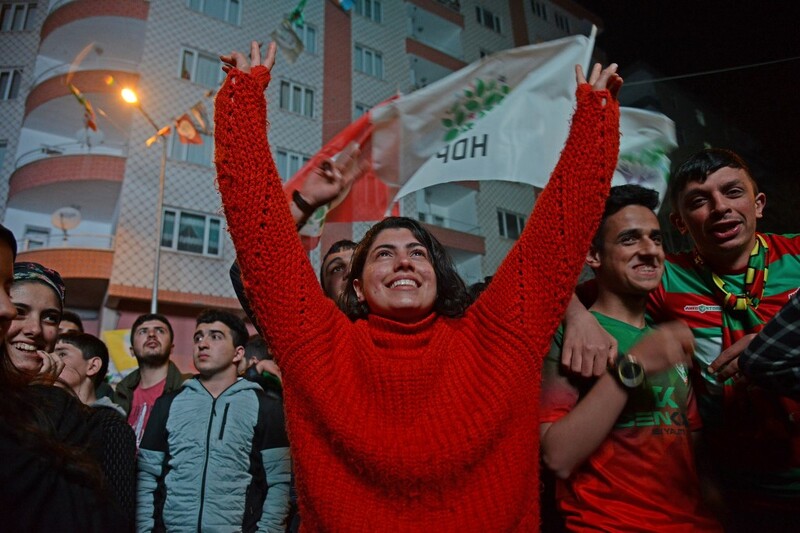 The loss of seats by the HDP creates a new complexity in Turkish politics. But it is part of a wider realignment among the Kurds in the region, as communities in several Middle East countries try to maximize their gains in a rapidly changing landscape. Across Turkey, HDP’s overall share of the vote fell to 4.24 percent, from 11.7 percent in last year’s parliamentary election. Most crucially, the HDP lost the province of Agri on the border with Iran, and Sirnak, on the Syrian border, both provinces they had won comfortably five years ago. Overall, of the Kurdish-majority provinces contested by the HDP and the AKP, Erdogan’s party won about half, a quite surprising turn around. The reasons for that loss are not immediately obvious. The southeast has been worst affected by the long-running war between the Turkish government and the PKK, a terror group that has fought an armed struggle since the 1970s. Violence flared again in the region from 2016, and many of the cities and provinces that voted for the AKP were first devastated by war and then benefited from subsequent rebuilding work from the central government. One explanation, preferred by the pro-Erdogan media, is that the Kurdish populations blame the HDP, which is widely seen to be close to the PKK, for provoking the government. Even if some Kurds believe that, it isn’t immediately obvious why the sentiment has changed so much since parliamentary and presidential elections last summer, when the HDP did well. Indeed, the explanation may be simpler: many of the cities require extensive funds for public infrastructure, and it is possible voters believed they were more likely to get them with the ruling AKP in charge at the local level. Yet it would not be surprising if many of Turkey’s Kurds were simply weary of war and looking to the central government for some stability. One of the lesser-discussed aspects of the struggle for Kurdish rights, not only in Turkey but in other Middle East countries, has been the divisions between the people and the political parties. Sometimes, the parties have pushed harder for confrontation than the people were comfortable with. A glimpse of a change came earlier this month, when Nechirvan Barzani, prime minister of the Iraqi Kurdistan region, and widely tipped to replace his uncle, Masoud Barzani, the current president, gave an interview in which he sounded an unusually understanding note toward the capitals of the region. Speaking to the US online magazine Al Monitor, Barzani said the PKK was “providing the pretext for Turkish intervention” and that it wasn’t acceptable for “such groups to operate against our neighbors.” He also had harsh words for Syria’s Kurds: “I believe our Kurdish brothers in Syria have behaved negatively toward Turkey.” He urged Syria’s Kurds to go back to the regime. For someone who aspires to lead Iraqi Kurdistan, the most successful community of Kurds in the region, such words are surprising. One explanation is that, after 2017’s botched referendum, which provoked Iraq’s central government to retake the disputed oil-rich city of Kirkuk from Kurdish militias, Barzani has accepted the need for a more conciliatory approach toward Baghdad and other national capitals. Certainly, after a long period in which aspirations for greater Kurdish autonomy and even statehood seemed possible, the capitals of the region are now more ascendant. In Turkey, Erdogan, although he suffered a setback in local elections this week, will now face no more elections until 2023, leaving him free to continue his confrontational policies toward Syria’s, and even Turkey’s, Kurds. In Iraq, relations between the central government and the Kurdish region are being rebuilt under Prime Minister Adil Abdul Mahdi, but the upper hand is very much with Baghdad. And in Damascus, the Syrian regime is watching the Syrian Kurds seek allies from Washington to Moscow, but appears confident the Kurds will eventually have to accept a return to the regime fold. Last week, a Syrian Kurdish envoy suggested the Kurds would merge their forces with the regime’s army in return for limited autonomy. The election losses for Turkey’s ruling party is good news for other political parties. But for the Kurds in Turkey, coming as it did in tandem with losses for the pro-Kurdish party, the consequences will be at least mixed. It does appear that, in a rapidly changing political landscape, some Kurdish populations are shifting from confrontation to cooperation with national governments, turning back from separation and taking the road to the capitals.